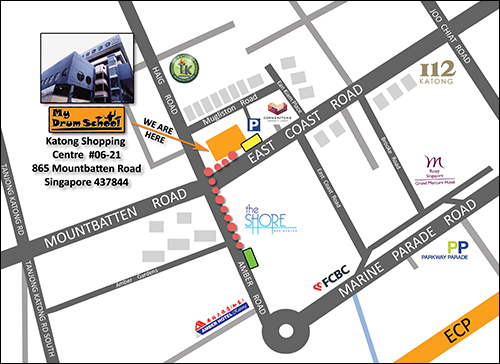 My Drum School Katong (East) is along Mountbatten, situated near Roxy Square and I12 Shopping Mall. Our school is located along Mountbatten Road, next to Odeon Theater. 1. Nearest station at Paya Lebar MRT Station (EW8/CC9). 3. Alight 2.6km later at Amber Gardens stop. See MRT GUIDE.